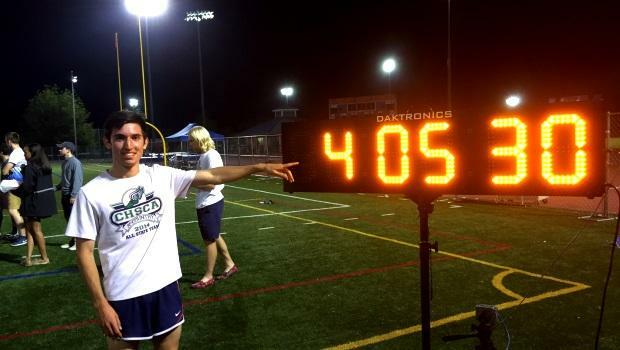 In what could have been the deepest high school mile race ever held on Connecticut soil, Eric van der Els cemented himself as perhaps the greatest distance runner to ever compete for a Nutmeg State high school. The Brien McMahon senior led 12 runners under 4:20 for the full mile and five under 4:13. While many of the runners in the field already had national-quality credentials, nobody could match his blistering pace from the start and his blistering kick to finish in 4:05.30. His time missed Staples' Henry Wynne's all-time Connecticut record in the event by.26 seconds. His time currently ranks as fifth in the nation for this season. Van der Els stated, "My goal coming into this race was to drop a PR since this would probably be my last high school mile where I can go all out and not have to worry about saving energy for another event a couple hours later. I would have been satisfied with anything under 4:08. I was totally shocked that I went that fast, considering I had had done it on a solo effort. I usually don't run my best when I run alone but I kept saying to myself that this could be my last high school mile and if this was my last mile I wanted to go out with a bang." "Up next will be the Class LL and State Open," he continued. "I'm planning on scoring as many points as possible for whatever event my coach needs me to run. I have also accepted my invite to run at the Brooks PR next month. I'm really excited to race the best in the country and end my high school career with a great race." Danbury coach Rob Murray assembled a field of the best distance runners in the state with Gabe Altopp coming from behind to set Ridgefield's school record running 4:10.04 for 2nd and Randy Neish clocking a tick behind is 4:10.59. Zakeer Ahmad of Staples and Armstrong Noonan of Darien also made the championship races at New Balance Outdoor Nationals by running 4:12.02 and 4:12.78. The top five finishers all rank in the top 50 in the country. Danbury coach Rob Murray assembled a field of the best distance runners in the state with Gabe Altopp coming from behind to set Ridgefield's school record, running 4:10.04 for second and Randy Neish clocking a tick behind is 4:10.59. Zakeer Ahmad of Staples and Armstrong Noonan of Darien also made the championship races at New Balance Outdoor Nationals by running 4:12.02 and 4:12.78, respectively. The top five finishers all rank among the top 50 in the country.